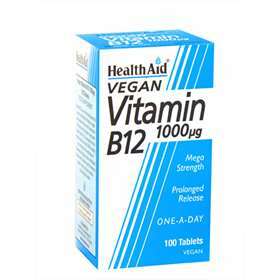 Vitamin B12 is often found in meats so B12 food supplements are recommended for vegetarians and vegans. Health Aid Vitamin B12, also known as Cobalamin, helps the break down and conversion of carbohydrates, fat and protein into energy. Vitamin B12 also supports healthy nervous system, production of red blood cells, and normal growth and appetite in children. yeast, gluten, wheat, soya, dairy, salt, artificial colours, preservatives and flavourings. May be helpful for mouth irritation or infections. Helpful to those with hereditary heart conditions. Children 3 to 12 years of age, one tablet daily. Adults and children over 12 years of age, one tablet daily, can increase to two tablets daily if required. Bulking Agent cellulose, hydroxy propyl methyl cellulose (HPMC), di-calcium phosphate), Anti-caking Agent (silica, veg. magnesium stearate), Capsule Shell agent (HPMC, glycerine), Vitamin B12 (cyanocobalamin).